The Intimidator Beam LED 350 is the latest addition to the Intimidator series of powerful moving heads and scanners from CHAUVET DJ. Incorporate the unit into your setup for razor-sharp beams and tantalising effects. Fitted with a bright, high-power 75-watt LED, the Intimidator Beam LED 350 projects a tight, concentrated beam with a 4-degree angle. Hang it from your TRUSST or place it on a stand to enhance any gig with aerial and long-throw effects or utilise the automated frost filter to convert the beam into a wash light when needed. 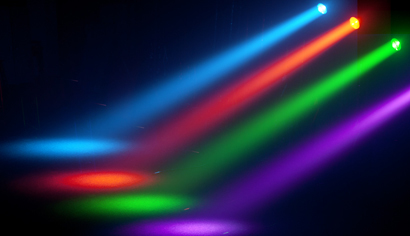 Easily create complex light shows with this versatile fixture that includes an eight-position color wheel, five-position fixed gobo wheel and animation effects, while its three-sided prism splits the beam covering larger areas. It has remarkably fast pan and tilt speeds which allow the beam to cut through haze for impeccable aerial shows. For simple operation, Intimidator Beam LED 350 features built in, sound-active auto programs. Or, to design your own light shows, program the fixture in 8-channel or 14-channel DMX mode. Built-in movement macros and move-in-black features minimise programming time, while power linking saves time running cable and extension cords. For a large, coordinated light show, use Intimidator Beam LED 350 in master/slave mode with Intimidator Spot LED 350. The Intimidator Beam LED 350 is available now priced at approximately £729.